These pan-fried, flavorful Brussels sprouts are an adaptation of a dish that I had at ilili, a contemporary Lebanese restaurant in Manhattan. The walnuts make it extra special. Any time I can add walnuts to a recipe I do because they are a great source of Omega 3’s. So incredibly good for you I like to serve this dish with a side of vegan sour cream because the fig jam is a tad sweet, but it works. I had the sour cream left over from my noodle kugel adventures this week…prepping for Rosh Hashana. More to come on that this weekend! Chop the walnuts and place on a baking sheet lined with tin foil. Toast for 5 to 7 minutes. Slice the grapes in half. In a little pot, melt the fig jam and water together. Cut the stems off of the Brussels sprouts and cut in half. Place cut side down in a big skillet with olive oil and cook until browned. When they are done, toss with salt and a few dashes of sherry vinegar. 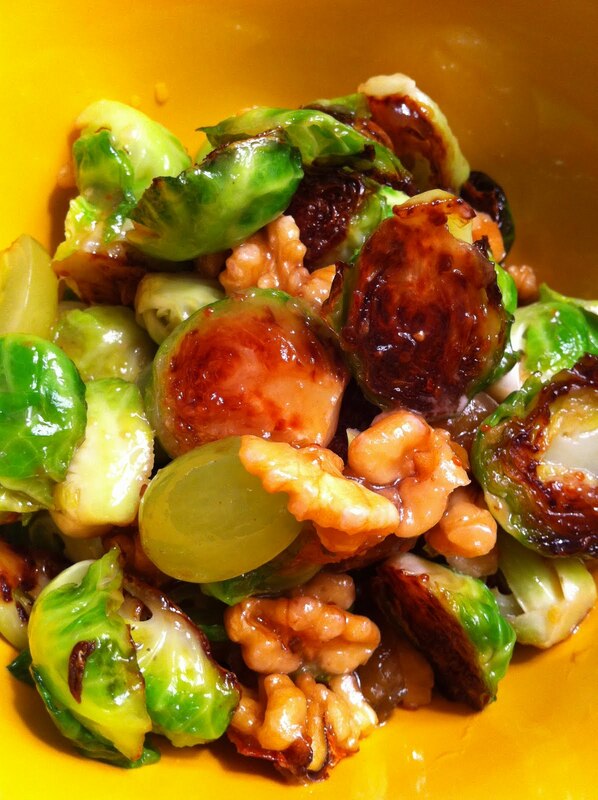 Mix in the walnuts, grapes, and fig sauce. Combine well. Serve with vegan sour cream on the side. Great hot or at room temperature. Enjoy! Rosh Hashanah: Diana’s Noodle Kugel…Veganized!